This is what Google Maps is great for. Creating your own map with points of interest relating to a specific topic and place. This map was created by a friend of mine who is partial to the odd glass of vino. It highlights what he considers to be the best Barcelona bodegas. Or the ones he has come across so far at any rate. So what is a bodega? In Spanish the word ‘bodega’ means cellar. But in Spanish-speaking countries it is often used to describe a winery, wine cellar, wine shop, bar or even a small convenience store. But for the purposes of this map we are largely dealing with shops and bars in the centre of Barcelona where you can buy and drink wine. Most of the bars offer great tapas, some of the shops have wine tastings and some have space for general consumption too. Definitely something for everyone. Each bodega in Barcelona (and there are over 40 currently) has a concise but informative review and there’s even a route mapped out for you if you so desire, although I wouldn’t advise you try and do them all in one day. 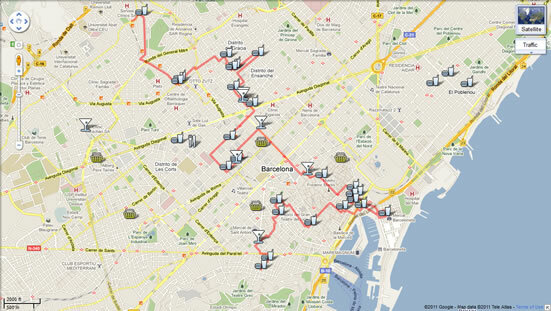 So take a look at the map with the Best Bodegas in Barcelona. I’m sure you’ll find something of interest. I know I have. Are there any other bodegas in Barcelona you think Mark may enjoy? If so, leave a comment. And after the necessary field research Mark may add it to his map. You can read Mark’s Perfect Day in Barcelona on this very site – Mark’s Brill Day in Barna. Or for further wine related exploits take a look at Mark’s wine blog – steelwine.blogspot.com. Thanks Joe! Not my map to add to unfortunately but thanks for adding it to the comments. Hi, I’m afraid it’s not my map so I can’t add your bodega to it. I will come and visit soon though! Check out Rob (H2BCN)’s recent post, Can you imagine Barcelona without any people?